Biting into what may seem like a very simple and classic lava cake turns out to be something pleasantly surprising. We are talking toasted marshmallow and graham cracker decadence oozing out of the center. I love when things surprise me. To a small pot, add graham cracker crumbs, sugar and butter and toast on medium heat for 2-3 minutes or until golden brown. Set your oven to broil. Add marshmallows to a baking pan and toast under broil in the oven for up to 5 minutes watching to make sure that the don't burn. Remove marshmallows then preheat oven to 425F. Add chocolate and butter to a microwave safe medium sized bowl and heat in intervals of 20 seconds stirring after each heating until completely melted and smooth. Next whisk in all-purpose flour and confectioner's sugar until batter is smooth. Lastly, whisk in two eggs and egg yolk and vanilla extract until the batter is well blended. 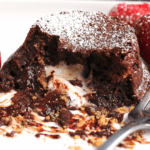 Using 3 (2-3 ounce) ramekins that have been sprayed with non-stick spray, fill each ramekin half way with cake batter. Next add two toasted marshmallow into each ramekin. Evenly distribute graham cracker mixture made earlier over marshmallows then spoon remaining cake batter over each cake. Bake cakes for 12-14 minutes then remove from oven. Let cool for 2 minutes then take a knife and run along the inside of each ramekin to help release the cake. Invert the cakes on individual plates. Dust with powdered sugar and serve warm.